It all started with me reading Richard Feynman's book "Surely you're joking, Mr. Feynman". In this book Feynman mentions lock picking. So I thought I'd give it a try. Turns out some locks are actually quite easy to pick. So, very late one night, while living in residence at the University of Waterloo, some friends and I go around the basements in residence to see how many secret custodian nooks and crannies we can get into, when we stumble onto the 'big one': The University of Waterloo service tunnel network. This is the sight we saw from the village tunnels - just one more lock to get open, and the extensive campus wide tunnel network was ours to explore - half a kilometer away, underground! Needless to say, we got the lock open! That first adventure in the tunnel was such a thrill. 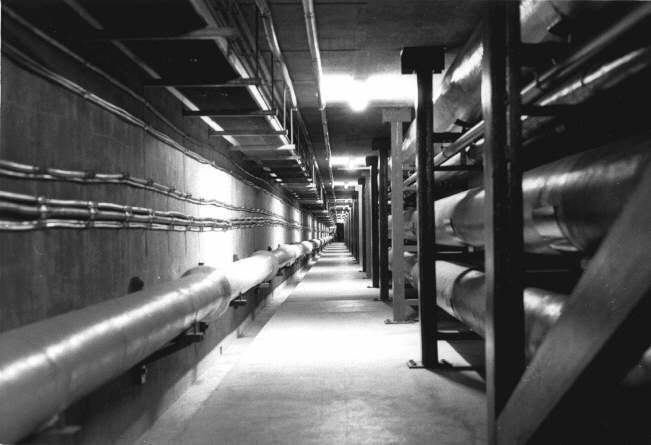 The constant fear of being caught and getting expelled from the university - the secrecy, the loud hissing and clanking noises from the steam pipes that sounded so much like footsteps. We were just so freaked out! 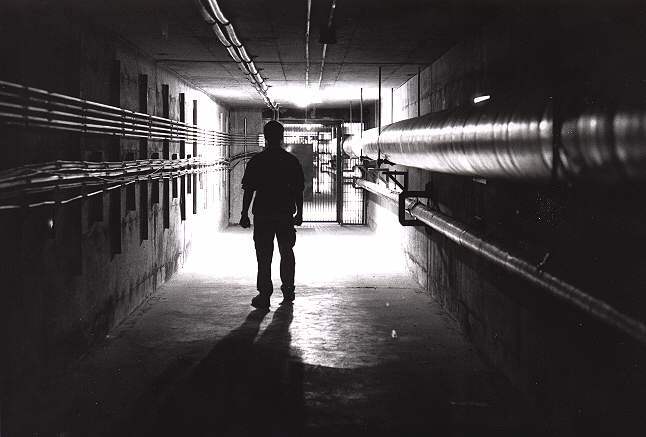 Just about every building on campus is connected to the service tunnels, and once in the tunnels, you could get into ANY building! Including Needles Hall, where they keep the marks and such. The reason the service tunnels exist is because the University of Waterloo, like many campuses, has a centralized heating plant. 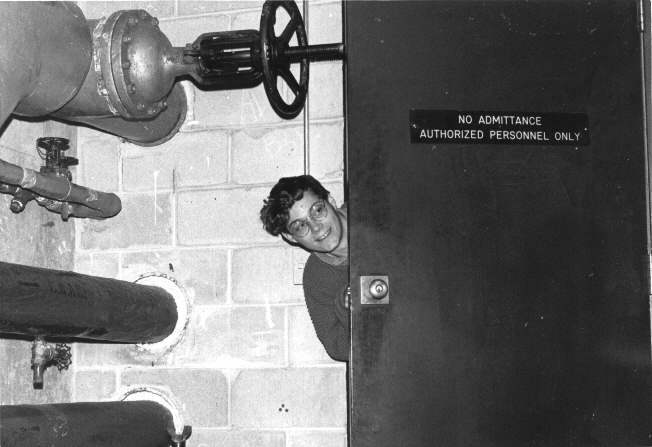 Heat from the heating plant is piped all over campus, where it heats the buildings. No doubt, many of these valves had not been adjusted in years, and it was tempting to make some adjustments to see what the effect on campus would be. We were however not quite that daring! During our first mission in the tunnels, we became horribly confused as to where we actually were. It was only by peeking out the occasional tunnel exit that we were able to identify which building we were actually under. We were wondering if it was even possible to know your way around these many tunnels. This naturally gave rise to the next challenge: Mapping the entire tunnel system. Some of the tunnel locations were quite obvious, because fresh snow would always melt were the tunnels were just below the surface (these tunnels get quite warm because of all the hot steam pipes). 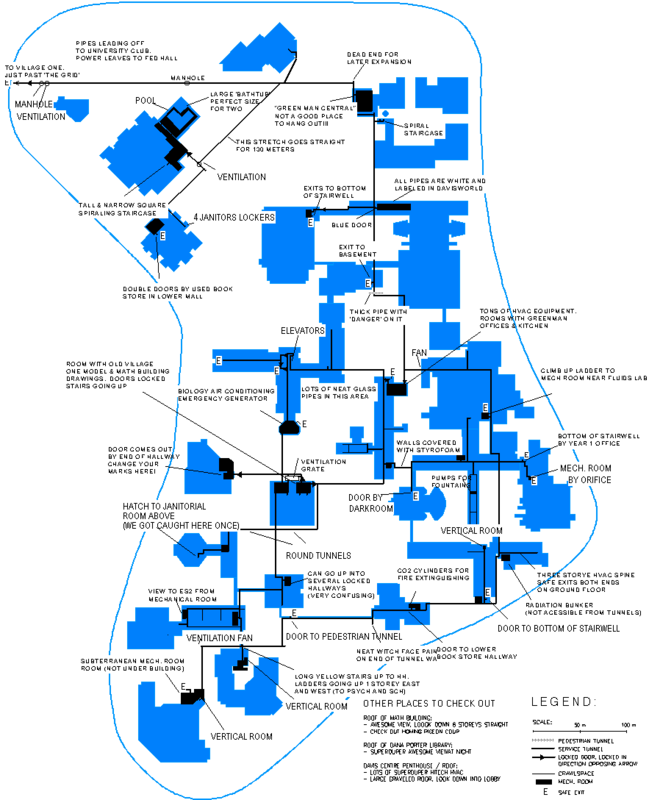 Other parts could be easily correlated to building floor plans by taking the occasional peek out of the tunnels. I also ended up taking measurements in some places to check how some things lined up with the map. 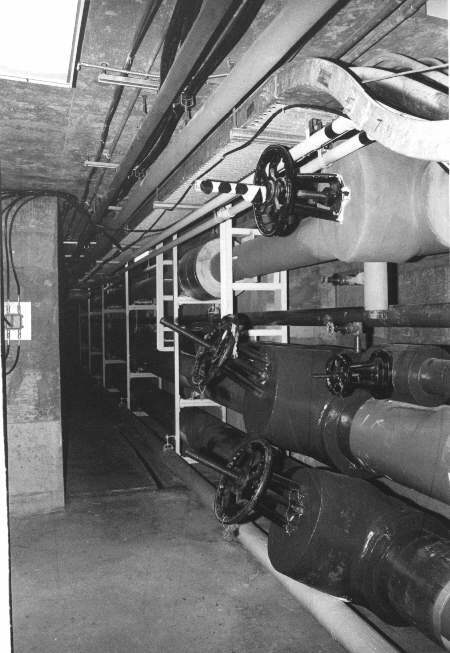 Exploring the University of Waterloo service tunnels is no longer the sport it was back in 1990. Somehow, somebody at some point got hold of a master key of the university, and everybody copied it. This made getting into the tunnels a relatively small challenge, and there were quite a few people who knew their way around the tunnel system - although few were as thorough in mapping it as I was. The University of Waterloo knew that people had keys, and I guess it was starting to become a liability issue. The last time I was down there, which was around 1992, I saw a motion detector, and turned around. Obviously, they had gotten more serious about catching people in there. All the locks going into the tunnels have since been replaced with Medeco locks, which are much more secure. I know this, because I have never been able to pick one open, and don't know of anybody who ever has! All the access points that were hatches and such have been welded shut, although there is a metal plate in a lecture hall in the physics building that appears only to be bolted shut. The old trick of getting something under the door to reach the doorknob on the other side has never worked either, as all the door knobs have 'collars' around them, which makes it impossible for some blind contraption to actually get hold of the knob. As such, I can't recommend you go exploring in the tunnels, but it was fun while it lasted. In the summer of 2002, a reporter from the Kitchener Waterloo Record contacted me to ask me some questions about my tunnel exploring activity. The guy had been researching this topic for an article, and found my website in relation to this topic.